The test measured five parameters (magnitude, dominant frequency, inter-hemispheric connectivity, hemispheric asymmetry, and phase) of delta, theta, alpha, beta and high beta brainwave activity in 20 locations around the skull. The findings were compared to normal brainwave patterns in healthy adults. The test showed a significant overall movement towards healthy brain activity after 5 minutes of BrainTime. Brainwaves in areas of the brain that were out of normal (i.e. overactive or underactive) became more normal. 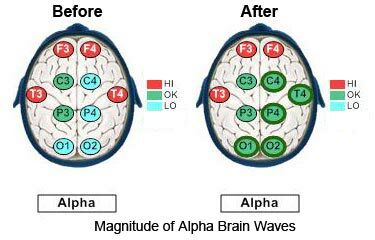 For example, the two figures above show the magnitude of alpha brain wave activity in different areas of the brain. Red areas are overactive and blue areas are underactive with magnitudes at least one standard deviation higher (red), or lower (blue) than normed populations. After five minutes of BrainTime, four underactive areas and one overactive area moved into the normal range. They are indicated by the green areas with heavy circles. 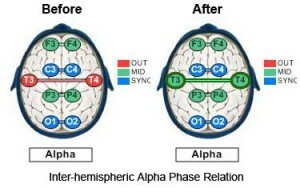 The next two figures indicate the phase relationship between the two sides of the brain in the alpha brainwave range. Phase relationship indicates how well the areas share information with each other. Red areas are poorly synched. They indicate phase relationships at least one standard deviation out of synch from normed populations. After five minutes of BrainTime, the phase relation between alpha brain waves in the area of the temporal lobes (the areas labeled T3 and T4) had moved into a normal range as indicated by the areas in dark green circles. This QEEG is a preliminary test only, showing what is possible after only five minutes of BrainTime. BrainTime evokes a state of calm, health-promoting activity in your brain. Communication between different parts of the brain is enhanced, and areas that are overactive or underactive come into a more normal range. Benefits begin to accrue after the first five-minute session, but the results are stabilized with ongoing use over a period of weeks and months. For best results, listen to BrainTime five minutes two or more times a day, seven days a week. Each five-minute session builds your brain’s ability to maintain an efficient, healthy style of function as you go through the rest of your day.